Although suppliers say you can use specific ones in a kitchen.....my initial reaction was “oh my god it’s going to look like a 1950’s drab house with spotty floors”. We sent off for samples....and we were blown away! In our previous blog, you might remember we tested and researched a whole raft of eco paints for a particular client we have – we also had to look at eco flooring, as this particular family’s sick child has breathing difficulties, so we needed to find non fibrous materials. We needed to find a floor for the kitchen/breakfast room where this family spends 80% of its time and also the bedrooms and upstairs hallway in this Victorian detached house. For the kitchen our hunt began with ceramic, perhaps not so eco or green you might think, but actually it is. Hygienic, well made and locally sourced too if you look hard enough. This was discounted by the family, they walk around bare feet all the time, so ceramic is cold to the touch and also the floor would not transfer sound, textures and feeling to the autistic child they have. We looked at vinyl flooring, bamboo, wood of course and even rubber! Vinyl has some great designs now but the gluing process would have given us vapours that were unacceptable to the family and the sick child. Bamboo is super and comes in a range of finishes, colours and thicknesses too, but as we were laying down on top of very bad Victorian flooring we really need this material and the clients didn’t like the look – too Asian in style in old English house. Personally I liked it and thought it would do really well – but then we design for clients not for my tastes! Wood as great of course, engineered board can be sanded a few times too, laminates were too slippery and the client’s did not like the look of them. Rubber was really cool but not so hygienic in a kitchen? Although suppliers say you can use specific ones in a kitchen. I’m yet to be convinced and the smell is strong when you first lay it. They talked of cork on and off in the first few weeks and my initial reaction was “oh my god it’s going to look like a 1950’s drab house with spotty floors”. We sent off for samples....and we were blown away! Some samples looked like the typical cork you would expect from the old tiles you were able to buy years ago. 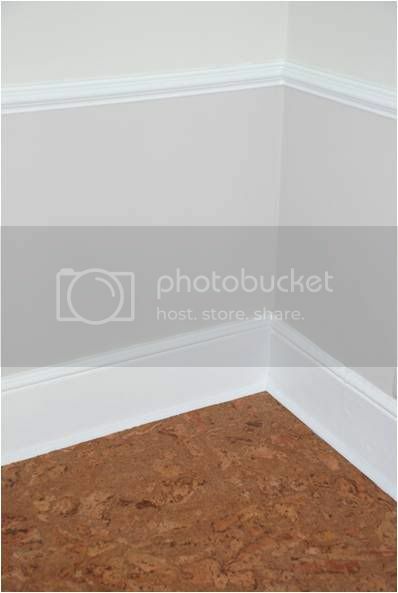 Last time I looked at cork flooring, 4 years ago, the choice was limited to...cork looking? But this time, we received cork that looked like burr walnut, beech, quartz looking and there was a tremendous variety of colour, of course it can be tinted or coloured, but it was rather amazing. We need something mid-brown and we chose the burr-walnut effect for the hallway and bedrooms. Here we see the little boy’s room ready to be furnished again, with the mid-brown burr-walnut look. For the kitchen (see here and main picture) we chose a very pale even textured and slightly mottled cork to go with the light oak and light blue units. In situ they look fabulous, but it was with trepidation that we laid them down, the builders were definitely not convinced- and still aren’t! 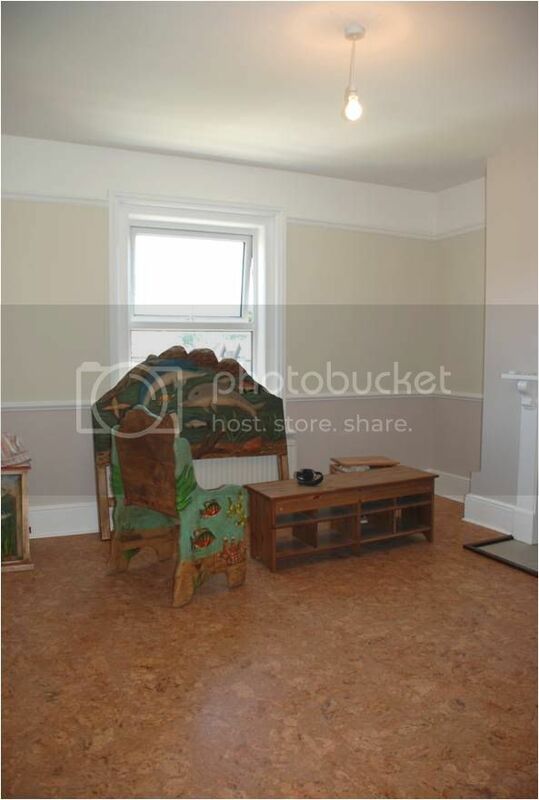 The connotations with old fashioned horrible yesteryear flooring is too strong! It comes pre-varnished with no organic solvents, UV treated and it can be sanded and re-coated. It stands up really well to scratches actually, even with our crew still doing work all over the house. I’ve washed it myself with hot water and Ecover floor cleaner, I have hoovered it and it’s a dream floor. 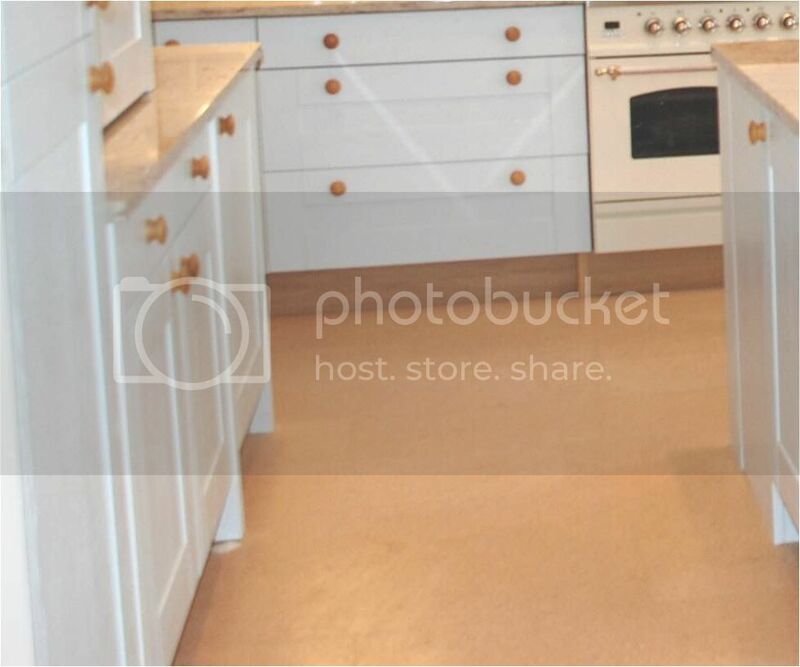 The kitchen being a light coloured floor does show up stains and marks easily, but the client wanted a very light room as their daughter need lots of natural and reflective light, so they are happy to hoover and wash as and when it needs it. You do have to watch out when you move furniture, and I wonder what it is going to do when we put back the huge cast iron radiator I have had sand blasted and re-painted (it took 8 men to lift out). In bare feet it feels fantastically warm, and soft, it’s a very organic experience. But it does look really swish, very designer and that is great. As for pricing, well just like the Eco paint manufacturers and suppliers, they are not geared up to wholesale trading really; the discounts are 10%, again no competition on normal trade pricing. Prices start around £20.99 per m2 to £31.79 but prices do vary. For us it was a huge outlay as we had to order over 300m2 of flooring. They come in packs and not in linear metres. They charge huge amounts for shipping and although they say they can delivery overnight, this is not correct as most companies have to order from the manufacturer. Again however, their customer service was exemplary, particularly www.corkfloor.co.uk. We were short of a few packs as we had not accounted for extra wastage on account of the wide boards, and this fab lady in the office sent us a few packs on an overnight delivery although it was 3pm on Thursday. We were then able to finish the kitchen before the owners came back that Sunday. So would I use it again? Definitely – in the right setting. It is not everyone’s cup of tea but in this instance the family came back to a healthy house and the little girl is thriving in her new environment.